I didn't have a post lined up for today, but then I got on Twitter this morning and read the sad news about Oscar Gamble passing away. Figured I'd snap pics of my little PC of his in tribute. Really like this Christmas Card auto. 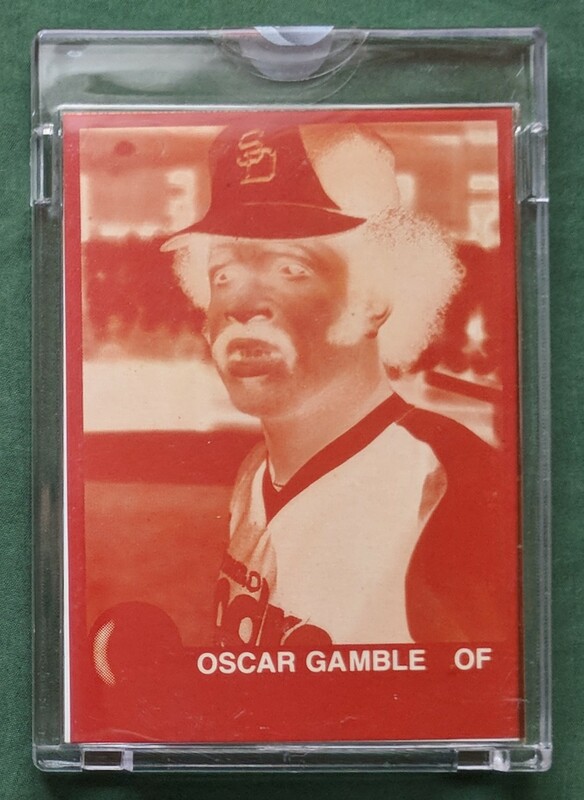 Cool that Oscar spent a year in San Diego. Landed this 1979 Topps Baseball 4 Color Film Positive from the Topps Vault a couple years back to add a somewhat unique item to the PC. Technically, these aren't in the PC, but plucked them out of my sets for this post. He sure has some cool looking cards. Career stats courtesy of the Archives back. Nice even 200 career taters. 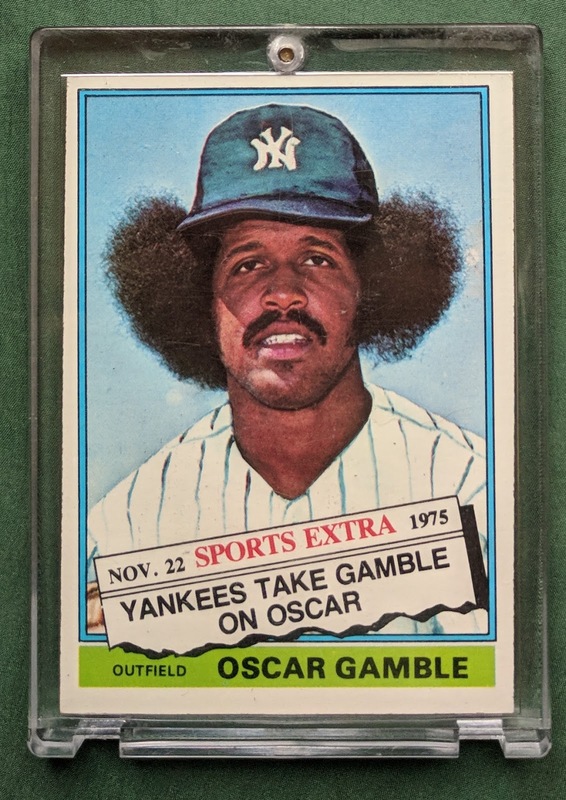 And of course, the cornerstone of any Oscar Gamble PC. Happy Flagship Release Day, everybody. (Oops, I think it's technically tomorrow, though plenty of it is floating around already.) I didn't buy any flagship in 2017, and I don't plan to in 2018 either. 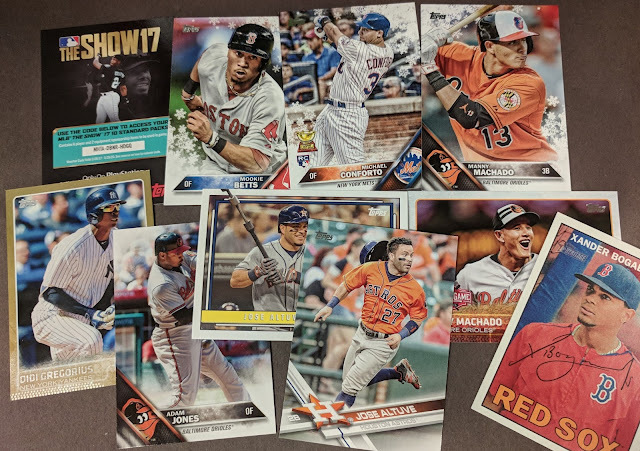 Topps' designs since 2015 haven't done much for me. 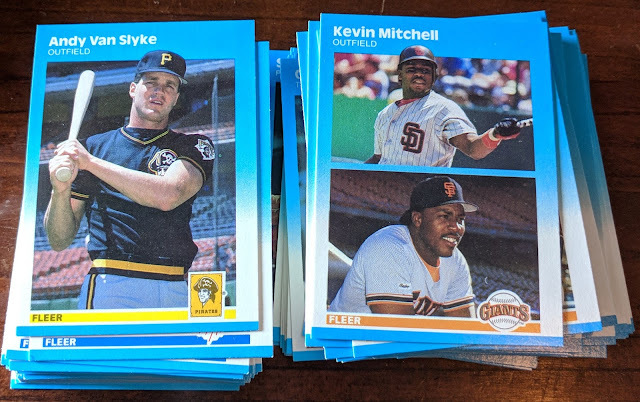 I'm content eventually adding cards I want from the set thanks to trader buddies. I remember hearing a little about this stadium giveaway from last year and was thrilled to get this near-complete set (gcrl plucked out the Garvey for his supercollection). 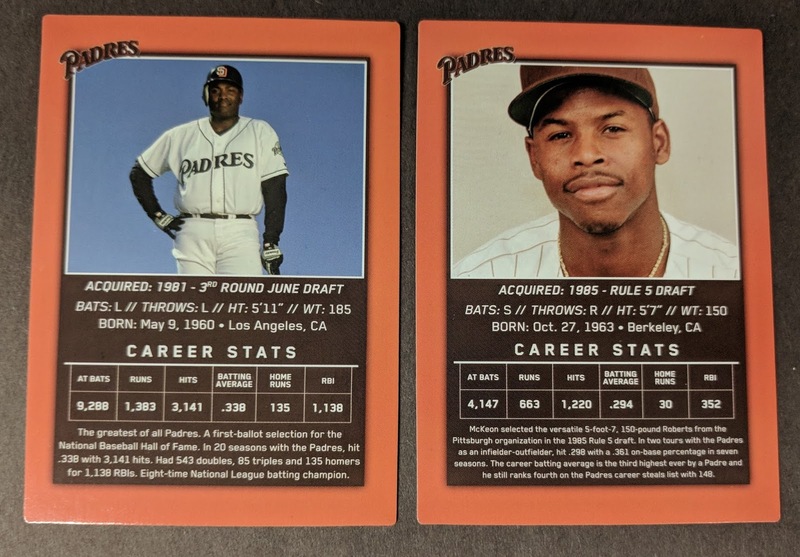 Awesome 58 Card Set only available at 1 San Diego Padres Game this season. By far the largest standard size SGA sets we have ever seen. Sponsored by Sony and issued to commemorate JACK MCKEON induction into the Pads Hall Of Fame . The set features all 1980's Players McKeon drafted, traded for, or signed as Free Agents. Too many to name but it is loaded and a great trip down memory lane with TONY GWYNN STEVE GARVEY RICH GOOSE GOSSAGE ROBERT ALOMAR SANDY ALOMAR JR GRAIG NETTLES BENITO SANTIAGO OZZIE GUILLEN FRED LYNN KURT BEVACQUA JOHN KRUK JOE CARTER BRUCE BOCHY JACK CLARK etc. The set is housed in a plastic case with a McKeon sticker on top. Because of how they were prepared, the cards were stuffed in the case and there are no gem mint cards. All are brand new but corners can have issues and that is the case with every set issued. 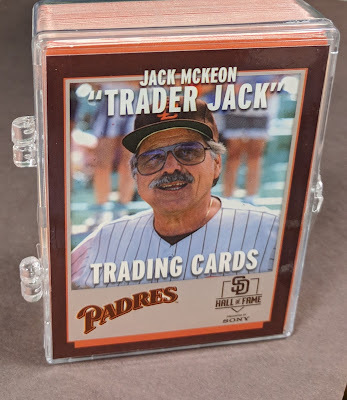 No PSA gems to be had, but for the true collector one of the nicest sets you will ever own. Pretty cool. I probably won't bother keeping it near-complete (though I wouldn't mind landing the Garvey someday), but rather break it up for my PCs since there are about a dozen guys I collect in there. 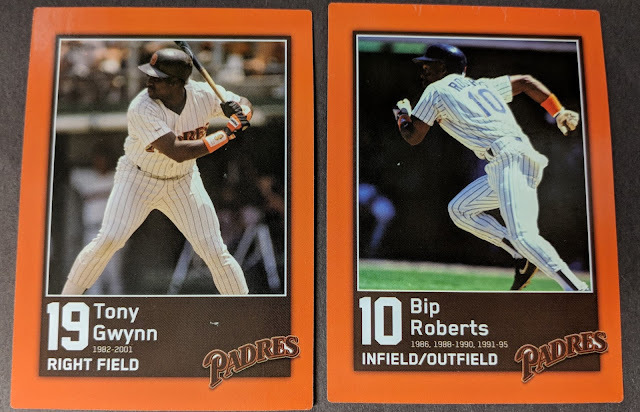 A couple of my top PCs right here in Gwynn and Bip. The description quoted above wasn't kidding when they said the cards weren't originally packaged with much care. Dinged corners and surface nicks abound. Some notable guys with brief stints in San Diego. Happy to add new Padres cards of Freddy Lynn, Joe Carter, and Kevin Mitchell. And the rest of the dudes I collect. The backs are fine, but I wish they had a little copyright line at the bottom. It'll be confusing when uninformed collectors stumble upon these cards years from now. 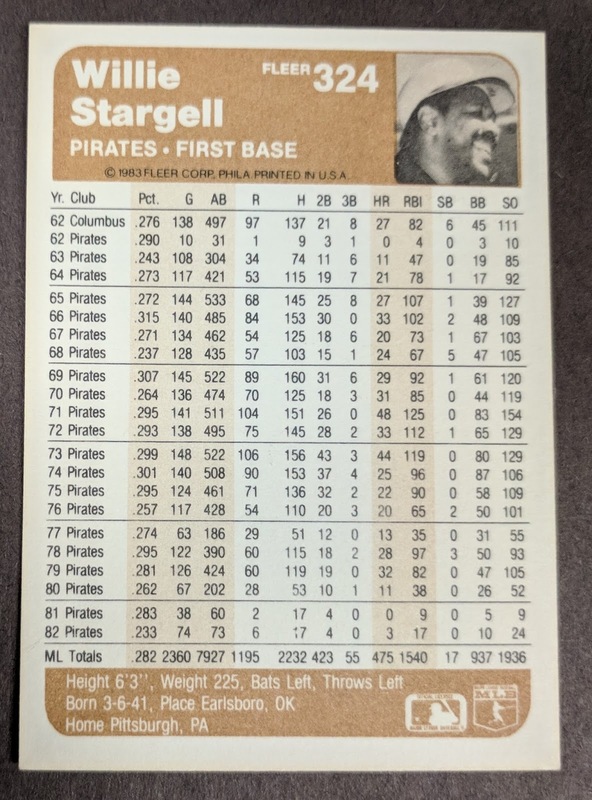 No card number, no year listed, no indication of who made them. For the record, I think these are referred to as 2017 Trader Jack Padres. Here's the perfect card for the "We Didn't Start The Fire" binder to upgrade the placeholder for the "Brooklyn's got a winning team" line, commemorating Brooklyn's only championship before moving to LA. Love those great Laughlin cartoons. 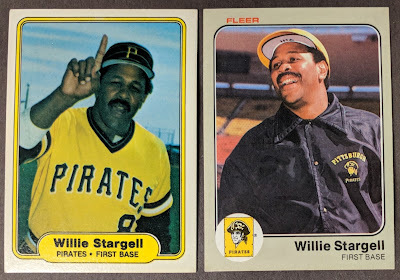 Nice Stargell duo here including the 1983 Fleer card that had been atop my Desperate Double Dozen wantlist for a while. 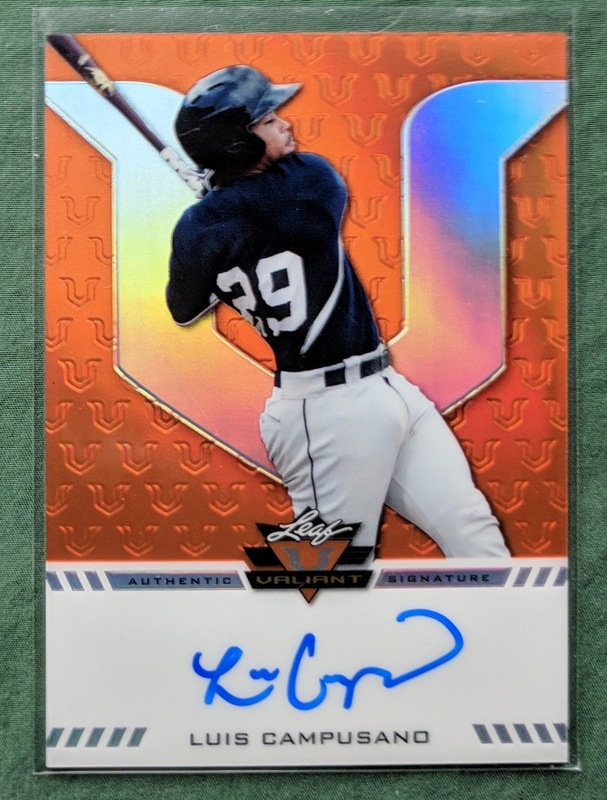 It's a beauty of a sunset/final tribute card. Full career stats, even squeezing in a AAA season. 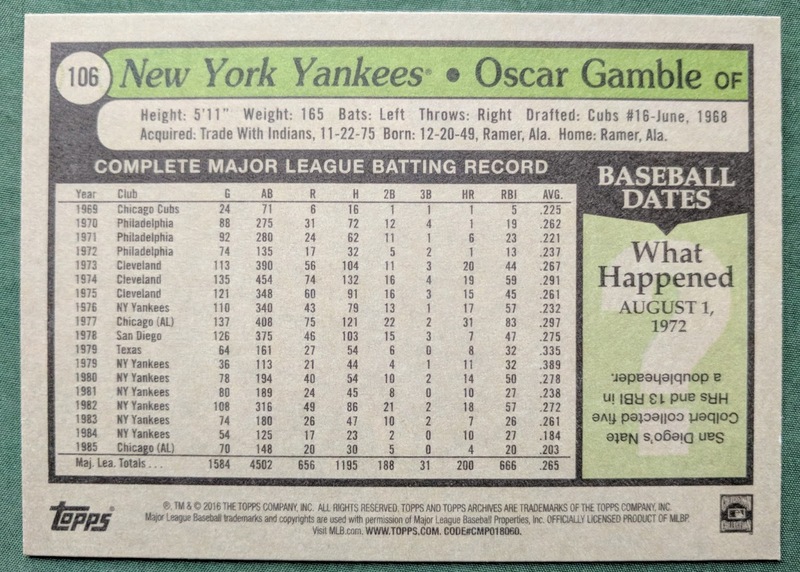 He also got a Donruss card in '83, but of course they truncate stats to just the last few years. He didn't get a '83 Topps card. Been wanting that gorgeous Stadium Club Winfield for a while now. Nice Margot additions too. Andre Dawson PC got a nice boost. Let's end the post with a big one. 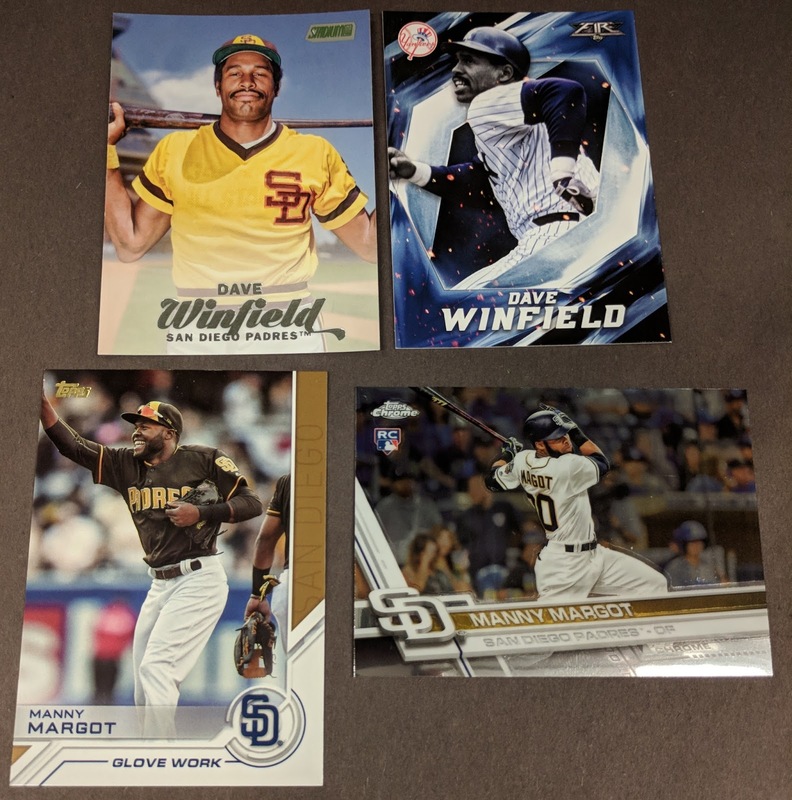 I always love getting Christmas Cards in trade regardless of the player/subject, but I really love when it's a Christmas Card of a main guy I collect! Big thanks, Jim! I'll be getting a return out in the mail to you later this week. Got a couple nice trade packages in last week. 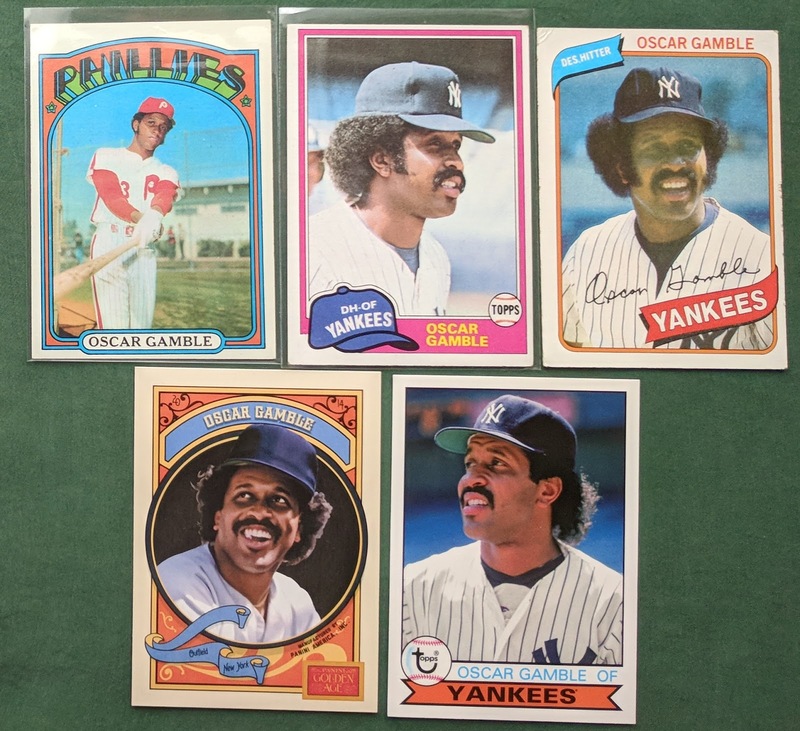 Reader Larry P. followed up the big lot I got from ARPSmith with another nice lot of 1980 Topps. Included were 100+ needs, upgrades, and wanted dupes for PCs. I'm now at 94% complete with the set! 43 cards to go. The "Highlights" and "League Leaders" subsets have both been completed now. Nice to be rounding the corner with this set already thanks to generous traders. I appreciate it, Larry! I've got your return package ready to be dropped in the mail asap. 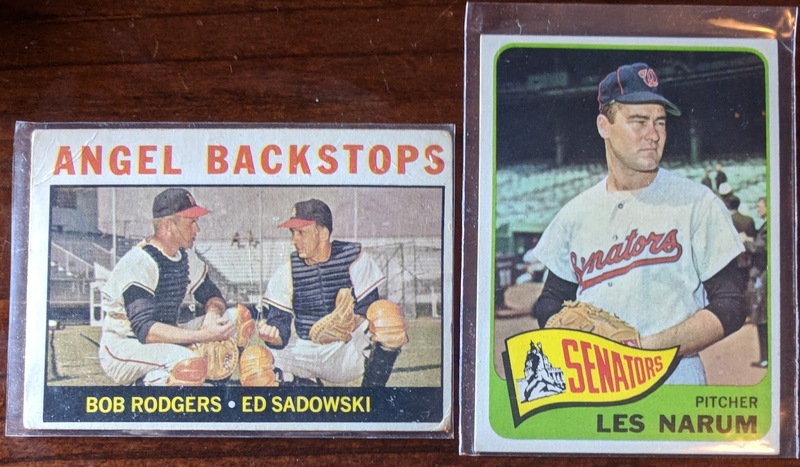 The other trade package I received was from Tom from the Angels In Order blog. 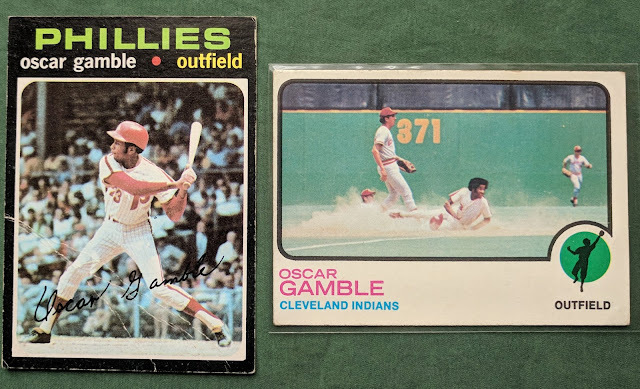 He expressed interest in the Jim Piersall auto I had available, and I used the opportunity to thin out my tradeable Angels on him while I was at it, filling up a small flat-rate box. Tom sent me a sizeable stack of 1980 Topps. Unfortunately, most of these were trumped by better condition copies from Adam or Larry, but there were still a handful of cards in there I could use. 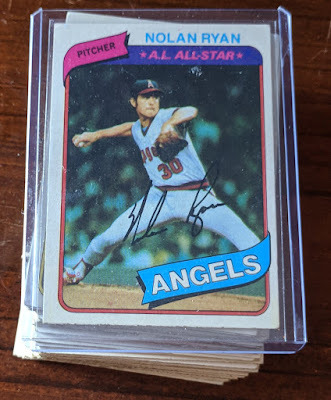 While I had gotten a Nolan Ryan in Adam's lot, I'm happy for the dupe from Tom since I've got a PC of the guy, so no harm there. Vintage! A need for my '64 Topps setbuild and the first upgrade of '65 Topps I've received since recently completing the set.. much appreciated! Felt good to replace the old copy of Les Narum in my set that had tape stains on the corners. Thanks for the trade, Tom! Oh wait, I also got a great trade package from gcrl the other day, but I don't think I'll be able to fit it in this post, so it'll have to wait another day. Today is Gavin Floyd's 35th birthday. Happy Birthday, Gavin! I've got a pretty legit PC of the guy. Pretty sure 7 printing plates is the most I have for any one player (probably only rivaled by Gavin LaValley's 4 or 5). Got a bunch of autos, too. I thought I'd use the special day of arguably the sports world's most successful Gavin as reason to post some other new Gavin cards I picked up recently, mostly from my recent Burbank Sportscards order. Here are a couple new names to the Greatest Gavins minicollection. 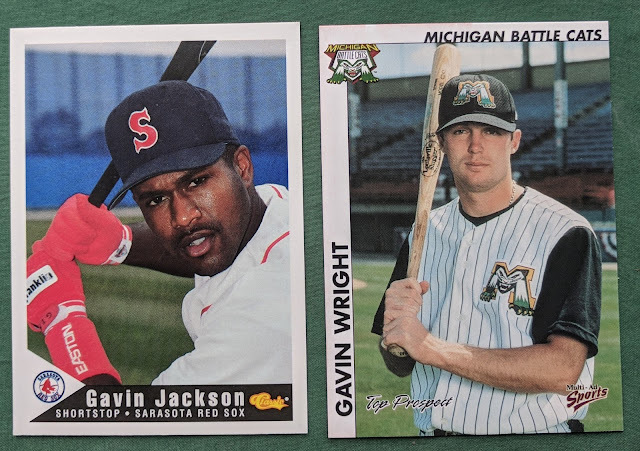 Gavin Jackson was a light-hitting middle infielder who made it all the way up to AAA-Pawtucket in the late 90s, but never made the Show. Gavin Wright was a speedy outfielder who topped out at AA in the Astros chain in the early 00s. 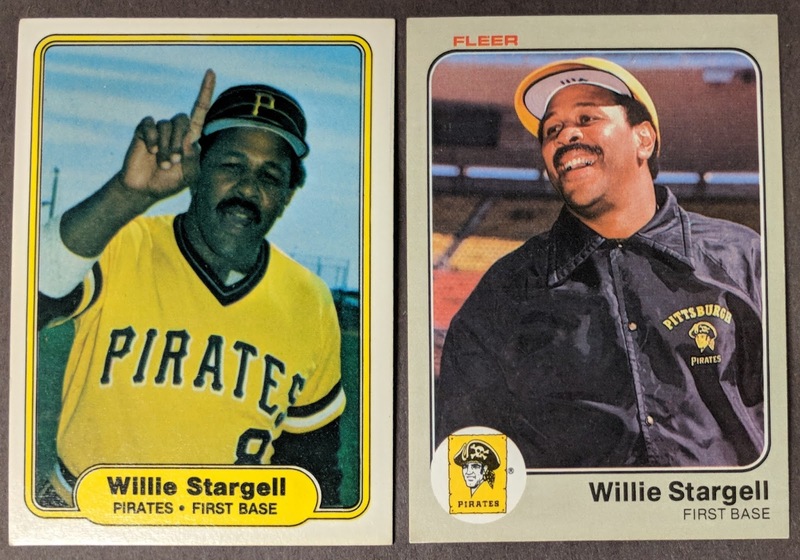 Here are a couple familiar names from the overproduction era. 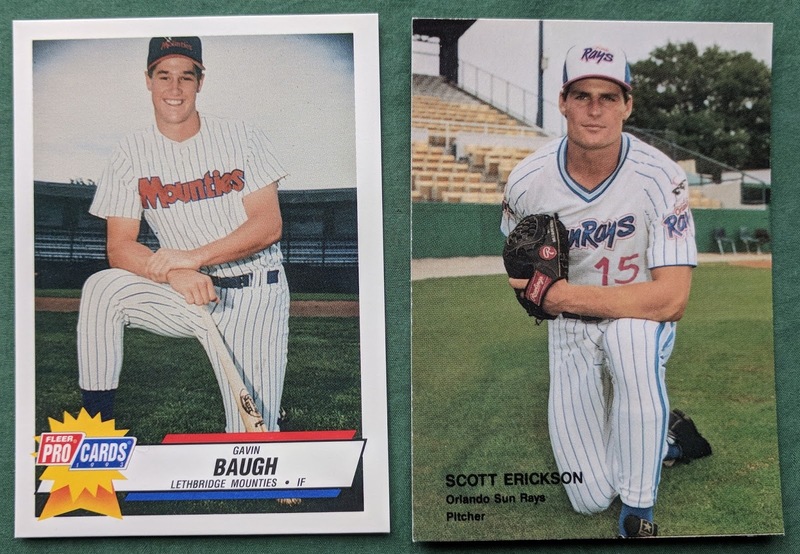 Gavin Baugh was on a 2-player rookie card in 1993 Topps, though he never made it out of A-ball. This is my first card of him besides '93 Topps and its variations. 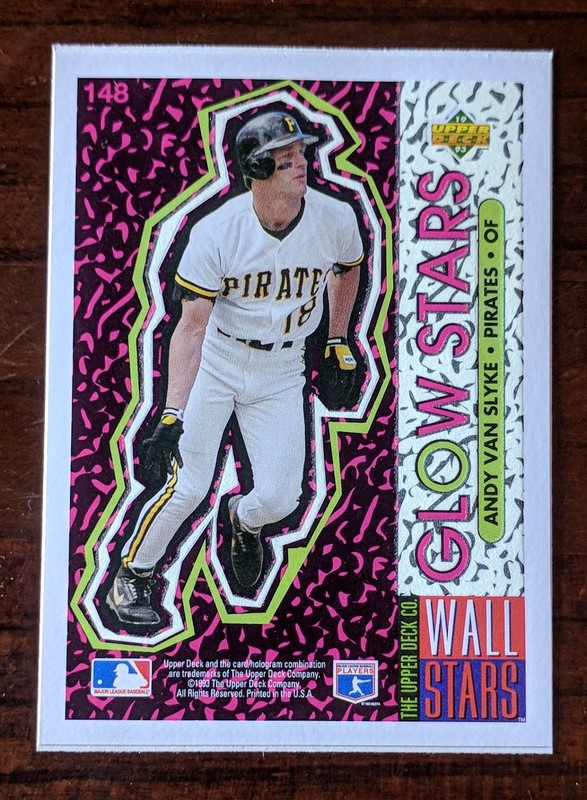 Scott Erickson is an honorary Gavin (his middle name), and I don't really collect the guy, but this neat minor league card popped up in a search and it was cheap, so I went ahead and added it to my order. 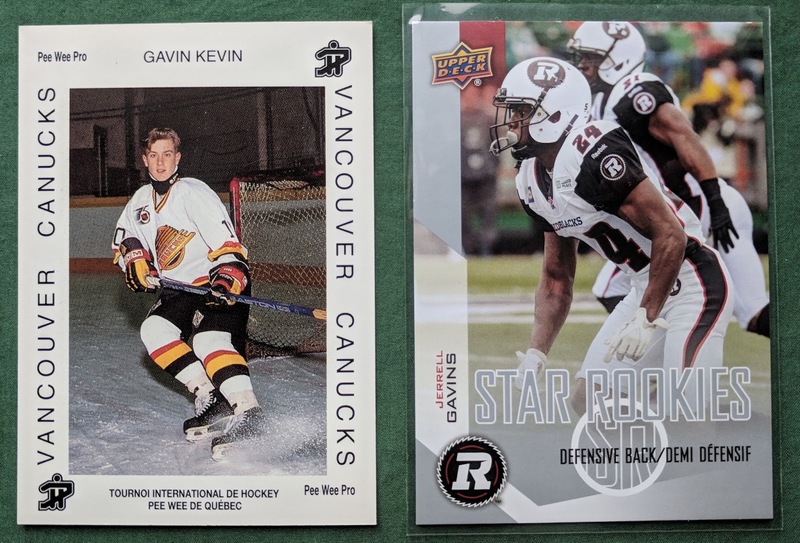 Can't believe I paid a little over a buck for it, but a 1992 Quebec Pee-Wee Tournament hockey card was quirky enough for me to pull the trigger on this Gavin Kevin card. 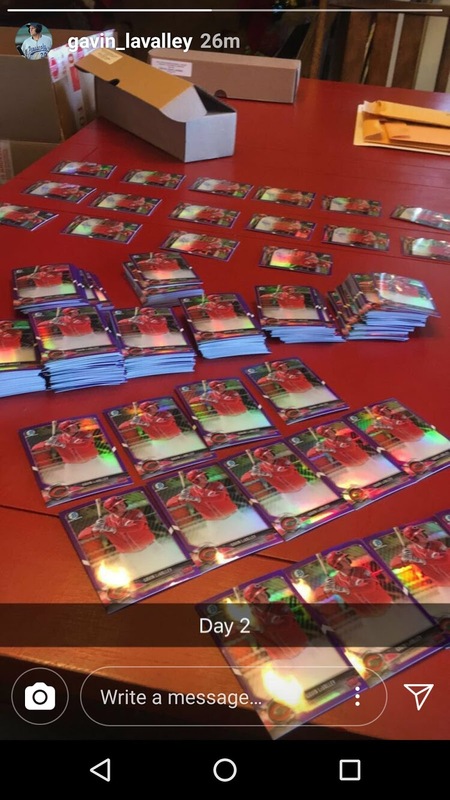 I don't think he ever went pro or anything, so this could very well be a 1-card completed master player collection. Jerrell Gavins might be pushing the boundaries of my collection (last-name-Gavin guys are skirting the line as it is, but a plural last name Gavin?! ), but I went ahead and got this in my latest COMC order. He's currently a defensive back for the Ottawa Redblacks in the CFL. More last name Gavins, with Dave and Tom. 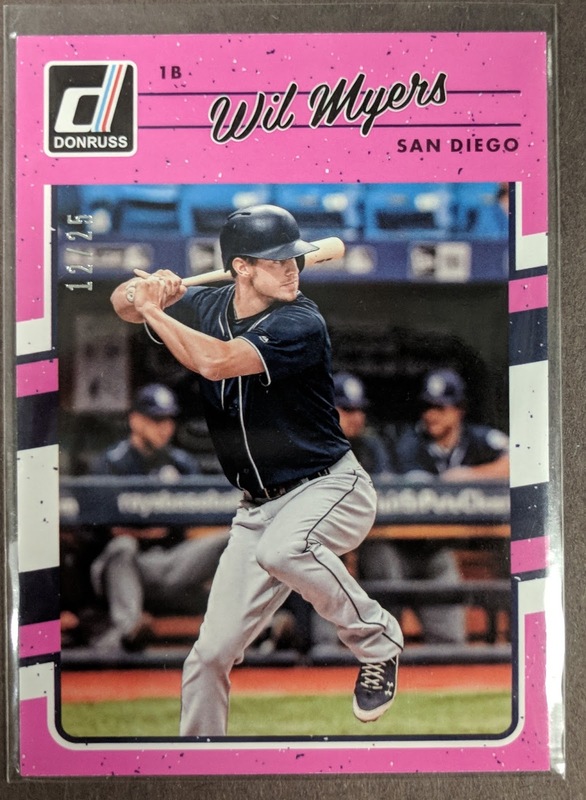 I already had a different Dave Gavin card, so this brings the PC to 3; pretty good for a guy with just a brief minor league career in the late 80s. Tom Gavin had an even shorter career. 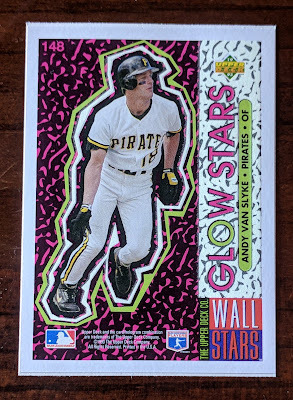 After a nice debut in 1990 with rookie league Elizabethton, he was done after a weak 1991 with A-Visalia. ...which is a good excuse to show off this rounded-corners beauty again. 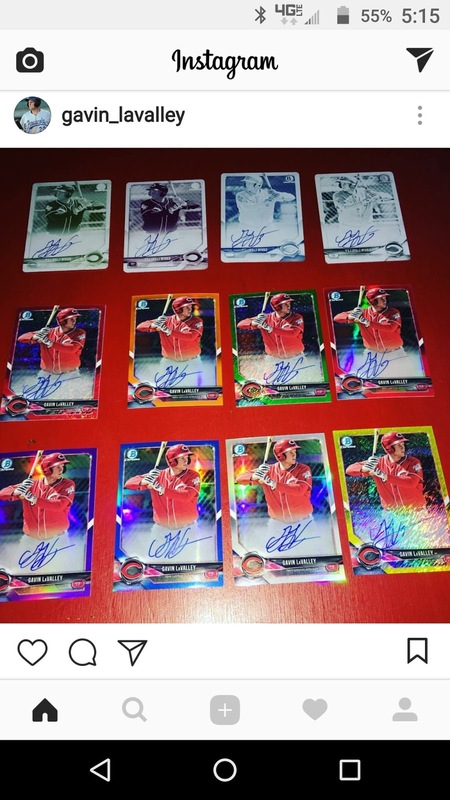 Yep, according to Gavin LaValley's Instagram, he's gonna have autos in 2018 Bowman (Thanks for the heads-up, Zippy). 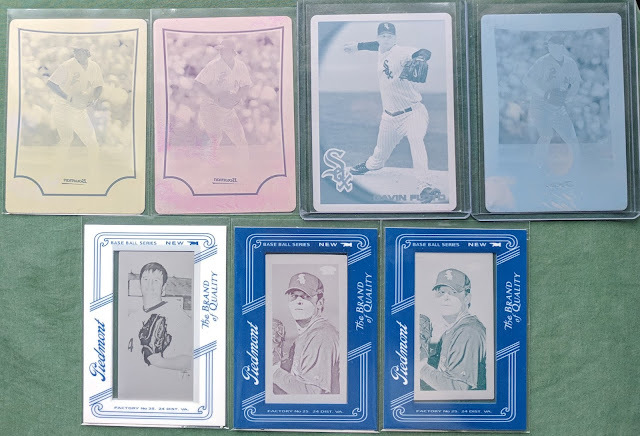 I'm still undecided if I'll take the expensive plunge of trying in earnest to rainbow these, or play it fiscally responsible and just try to land a few deals here and there. Probably the latter. 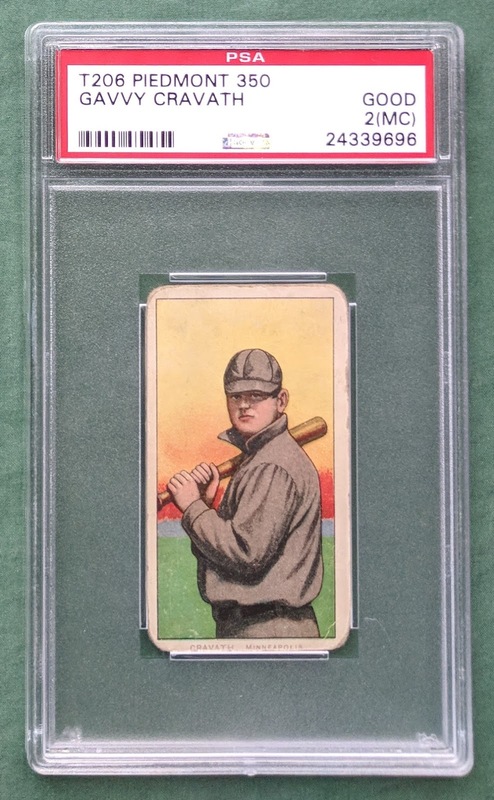 Though I'll keep an eye on the low-numbered parallels, and if they're not too pricey, who knows. Really depends on what the market is on these. His only prior Bowman card was back in 2014 Bowman Draft, and he didn't have an auto in that product, so these will be his first licensed autos. 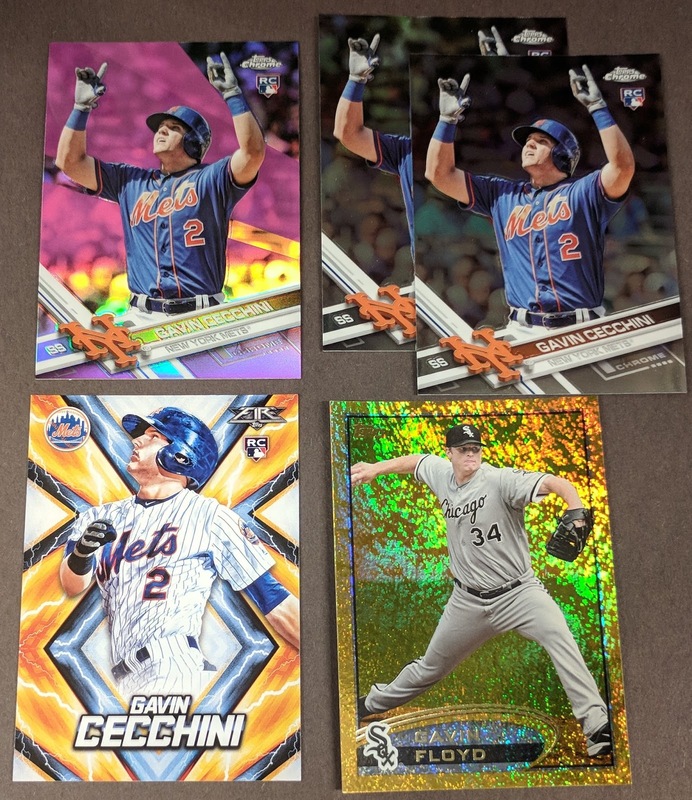 But yeah, nice to see him getting some love in Bowman this year. Also very happy that the autos are on-card, not stickers. It'll be fun adding a few of these to the PC soon. I'm curious if he'll have a base card in the set too. And what about Pro Debut and Heritage Minors? Hmm. While not as prominent as Topps or even Panini, there are still new Leaf baseball cards out there. 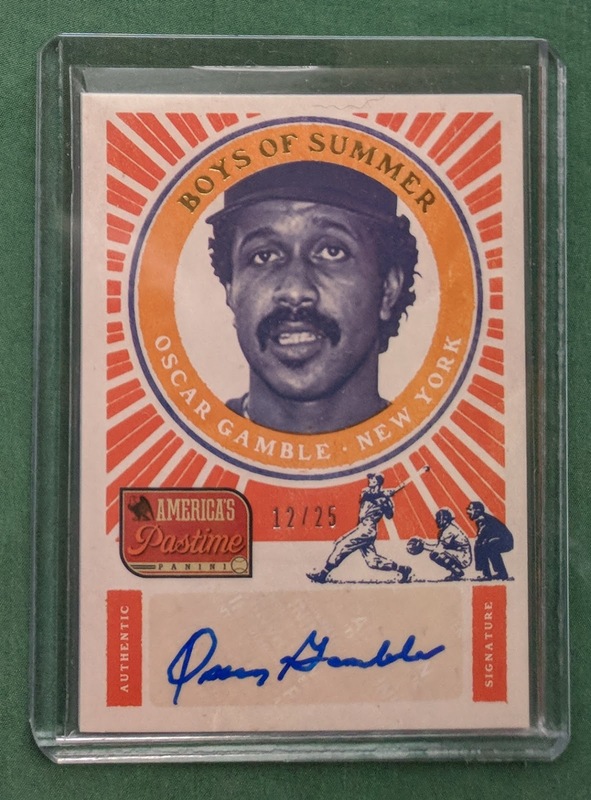 They're often a cheaper option for picking up autos of hot prospects. Here are a few that I snagged recently. Super excited to pick up an autograph of the Padres top prospect Fernando Tatis, Jr for about the price of a blaster a couple weeks back. ESPN scouting guru Keith Law just ranked Tatis as the No. 3 prospect in all of baseball, comparing him to a young Manny Machado. Tatis just turned 19 this month, so he isn't expected to crack the bigs for at least another year or two, but he's been wowing them in the minors and Dominican Winter League. Really hoping he pans out. I even had to give the honor of putting the card in a refractor screwdown case to maximize shininess and currently have it out on display. When the light hits it, it's really a gorgeous sight. It's a blue parallel numbered 6/25. From the brief write-up, you can see Leaf isn't scared of using team names, something Panini shies away from. 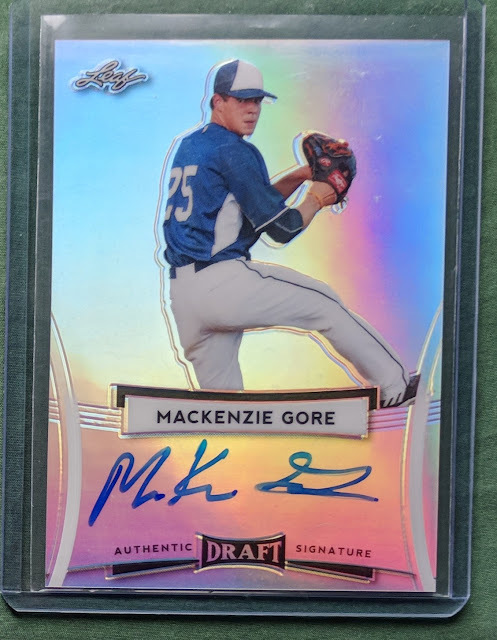 And here's the Padres' top pitching prospect, Mackenzie Gore. This is the card I alluded to when I showed off the Bowman Gore auto Sport Card Collectors traded me recently. San Diego could really use another dependable arm in the rotation, so hopefully he's ready to go in a couple years when all the rebuilding should start paying off. 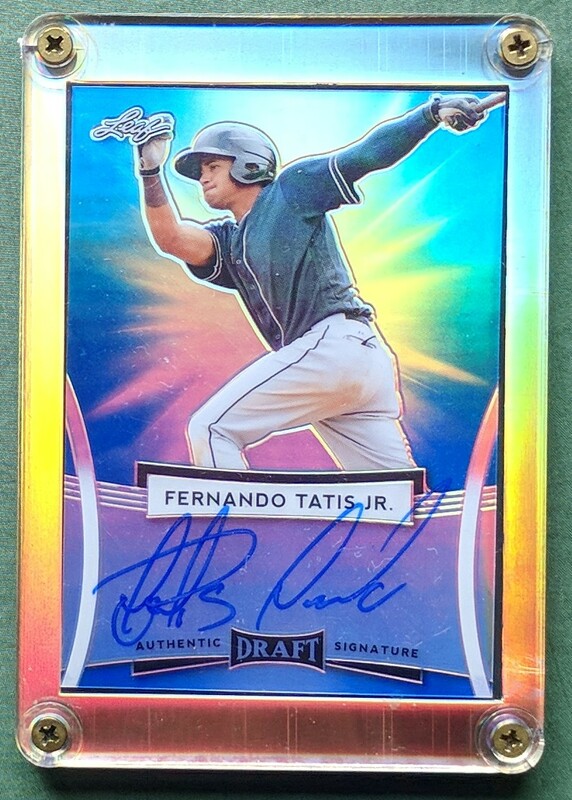 This one's not numbered, but still a nice, shiny, on-card auto. 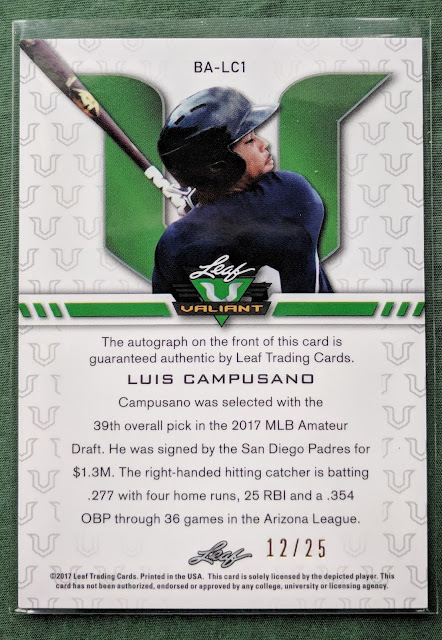 Luis Campusano is a 19-year-old catching prospect for the Padres. 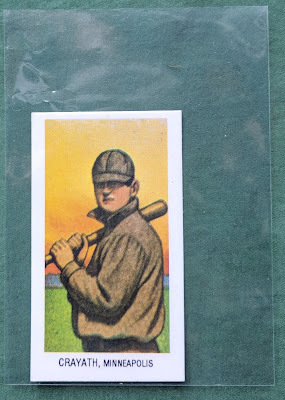 He's not as highly touted as those other two guys, but I won this Leaf Valiant card for a few bucks the other day. What really made me go after this particular card is it's a Christmas Card.. woo! 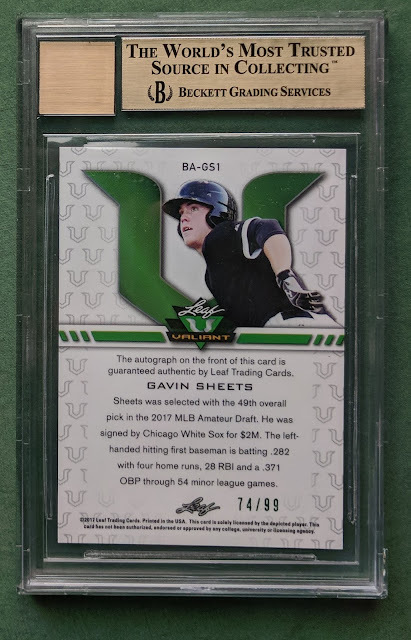 And a non-Padre pickup: another Gavin Sheets auto for that new PC. 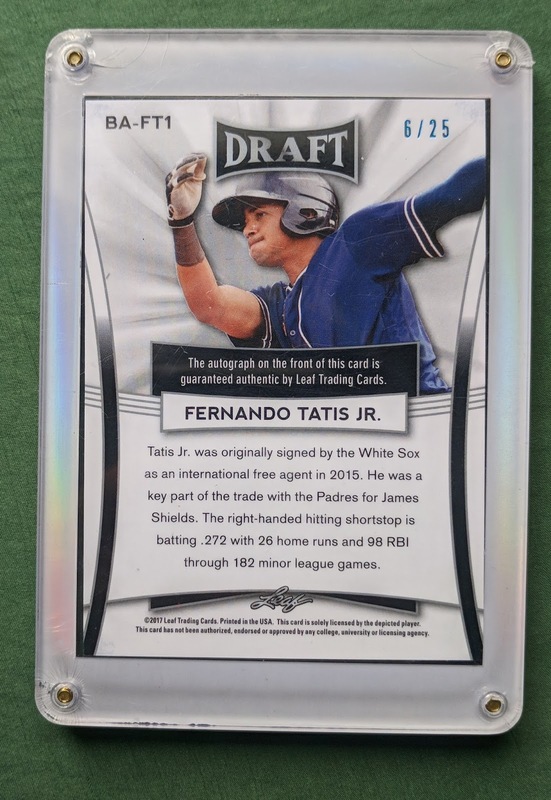 His Bowman autos are still running a bit pricier than I'd like to pay, but you can find Leaf autos for much less. In the spirit of this post's title, I'm also showing the back. Green parallel numbered to 99. Apparently this product came with an already-graded card in each box or something, and this is one of those. 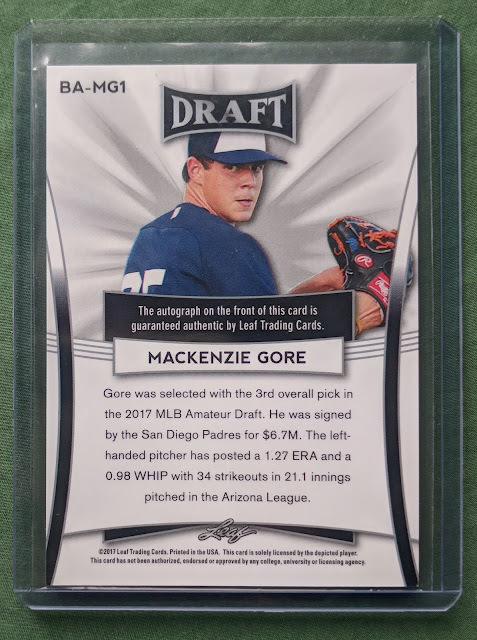 I don't care too much about grading, but again, the price was right. Padres fans such as myself are still basking in the afterglow from the recent announcement that Trevor Hoffman will be enshrined in the Hall of Fame. I don't need to tell you that it's a nice feeling to have one of your city's sports stars make the Hall of Fame. It'll probably be a long time till the Padres have another one. Maybe if Adrian Gonzalez recaptures his form with the Mets and has a few more good seasons, he might have a shot, but I wouldn't bet on it. And while not thought of as a Padre, there's Anthony Rizzo who briefly played for San Diego before being traded to the Cubs. If he keeps it up for another decade, he'll have built a good case for himself. 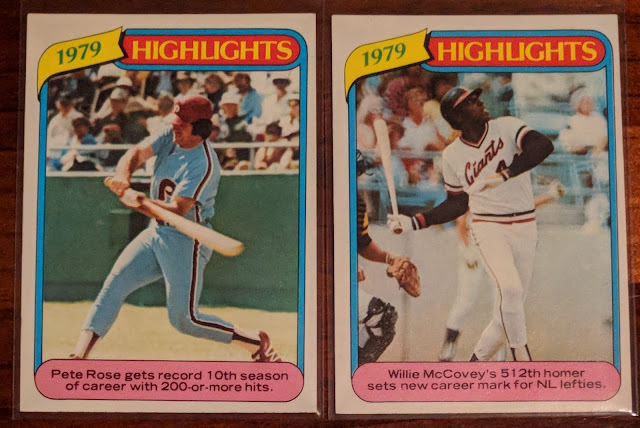 And I'm still holding out hope that Garvey and McGriff claw their way in someday. Gary Sheffield might eventually get in if/when voters lighten up about PED-tainted numbers. I'm the kid whose pumpkin is wearing a cowboy hat and big, bushy mustache. Marcus is the kid in vertical stripes. You probably can't tell, but I'm wearing a Padres shirt. Surprisingly, I still remember most of these kids' names. 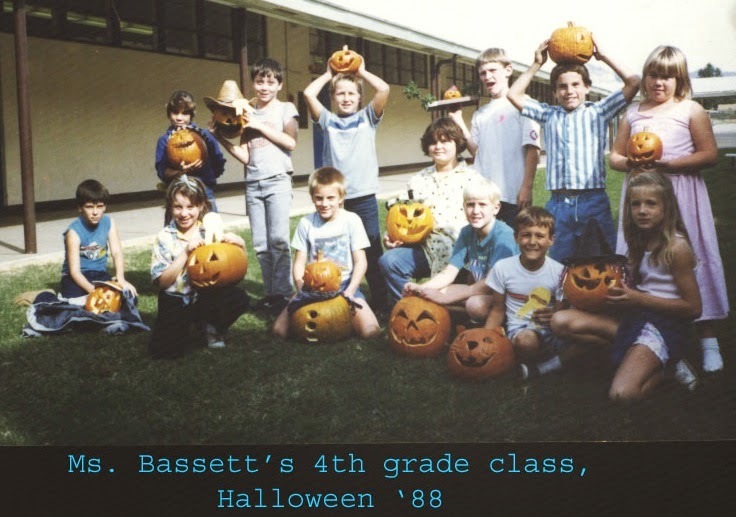 My best bud in the photo was Dave Paxton, the kid with the double-decker pumpkin. I've got great memories of slumber parties at his house.. playing NES, watching cheesy action movies, and getting into mischeif outside at night. But yeah, Marcus played on the 2007 San Diego team that not only included Trevor Hoffman, but also Greg Maddux. 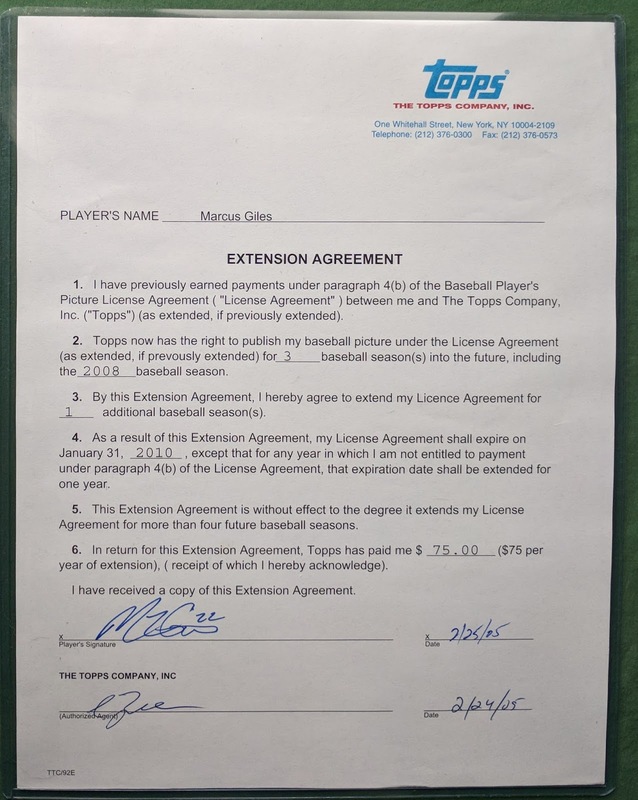 I recently won an eBay auction from the Topps Vault for this baseball card contract. 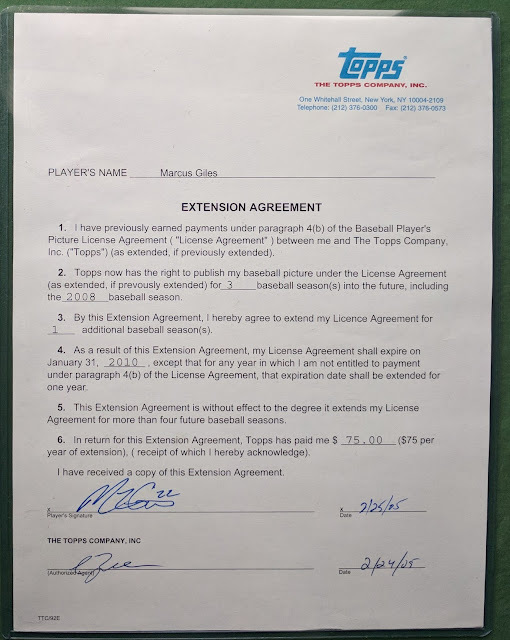 I get a kick out of Marcus including a jersey number inscription ("22") even on a legal document like this. I guess it probably becomes a reflex after signing so many autographs. Marcus also got to play with many great players during his years with the Braves. Maddux, Smoltz, Glavine in the rotation. Chipper Jones at 3rd. Andruw Jones in center. Gary Sheffield in right. Julio Franco on the bench. Fun to think I'm just "one degree of separation" from those guys, whatever that really means. 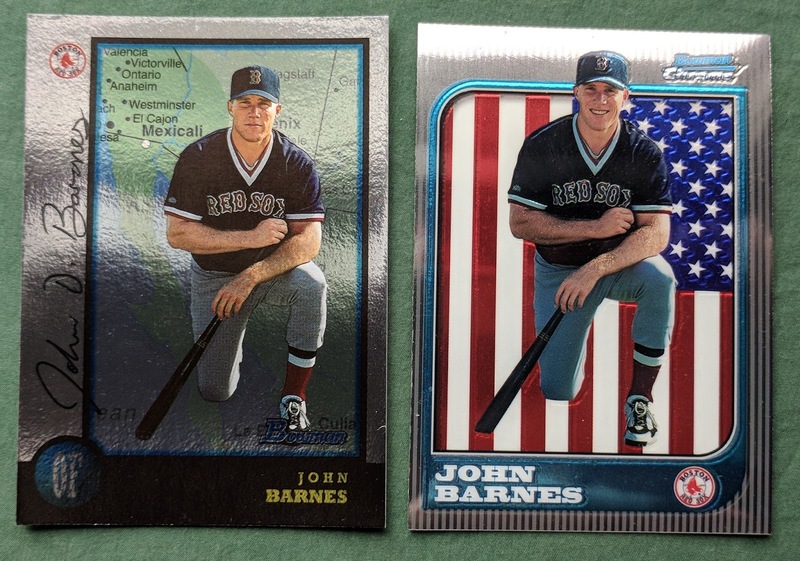 I picked up some new John Barnes cards in my recent Burbank Sportscards order. 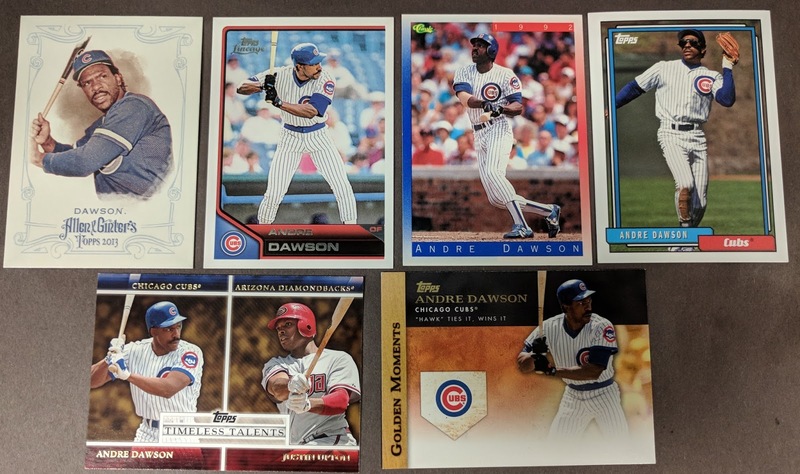 Gotta figure I'm not too far from completing this PC, as he doesn't have a ton of cardboard out there, but can't believe I didn't own any of his 1998 Topps rookie card. 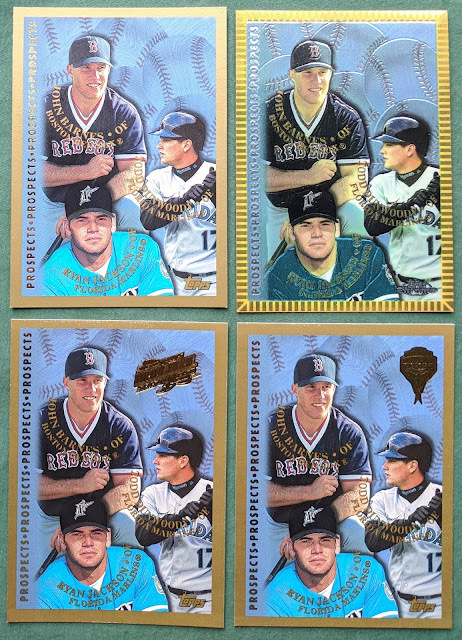 Here I've not only grabbed the flagship base, but also the Chrome and the inaugural season variations for the Devil Rays and Diamondbacks. John Barnes played on the 2000/2001 Twins alongside presumptive future HOFer David Ortiz. Barnes was a senior at Granite Hills when I was a freshman, so that means (by meaningless guidelines) I've got one degree of separation from Big Papi.. cool! Found a couple Shane Spencer needs from Burbank as well. 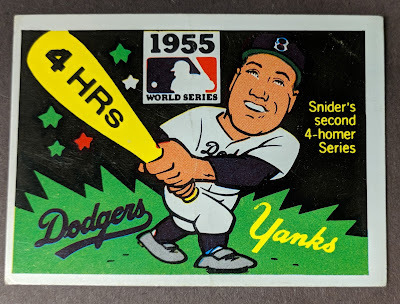 Shane played for the turn-of-the-millennium dynasty Yankees, so there are a lot of great players to link him to. I think Tim Raines is the only current Hall of Famer, but you've also got Jeter, Mussina, Mariano, Clemens, plus guys like Strawberry, Canseco, Giambi, Posada, Pettitte, Bernie, Tino, etc. Lots of household names there. 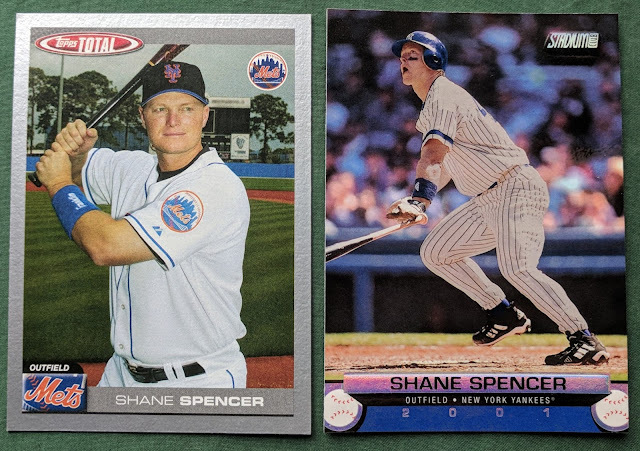 Spencer, who graduated a couple years before I started high school, finished his MLB career on the 2004 Mets alongside Mike Piazza and Tom Glavine. Casey Craig, who attended Granite a few years after me, never made the majors, but in the minors he was on the same teams as Adam Jones and Jeff Cirillo, each multiple-time MLB All-Stars. I was surprised I didn't already own this Bowman Chrome base card, as I've got some parallels of it. Tom Fordham graduated from Granite Hills a year or two before I started going there, so there's an added degree of separation there, but he played on the 1997/1998 White Sox teams that featured HOFer Frank Thomas, not to mention other notable names such as Ozzie Guillen, Albert Belle, and Harold Baines. 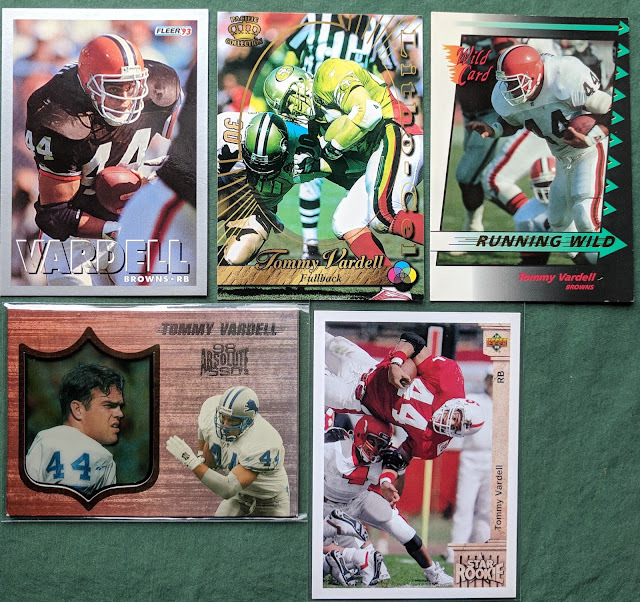 Added some Tommy Vardell cards to the PC recently, too. Touchdown Tommy played on the 49ers with HOFers Jerry Rice and Steve Young, as well as on the Lions alongside Barry Sanders. Some big names there! He was a few years before my time at Granite, but not too many degrees of separation from me. I was just about to say Vardell is the only Guy From Granite to ever play in the NFL, but then I just now discovered a guy named Joe Cardona currently with the Patriots and has been since 2015. Oh man, my mind is blown. Does this mean I have to root for New England now?! As a long snapper, he doesn't have many cards out there, but looks like he has a "Salute to Service" insert in 2017 Donruss (he played for Navy after high school). Anybody happen to have that card for trade? I'll need to track one down. Cardona went to Granite long after me, so I'm sure it's a long list of degrees of separation, but pretty cool that a guy from my high school played on the Brady/Belichick dynasty Patriots. Chris Jones (white guy from the 80s) played on the '85 Astros with Nolan Ryan. 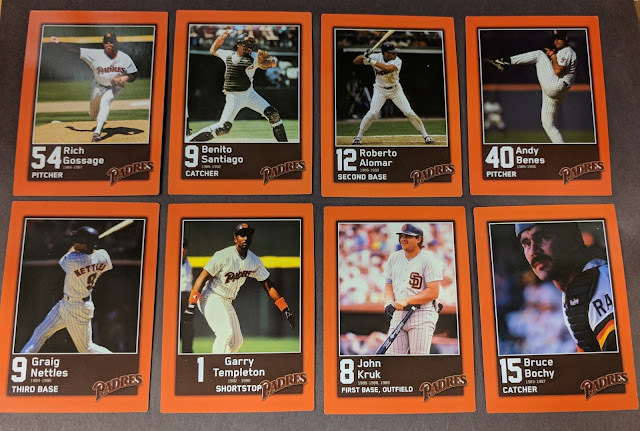 He was also briefly with the '86 Giants, but I'm not sure he was on the roster at the same time Steve Carlton was making a short-term stop there near the end of his career (I think they just missed crossing paths by a couple weeks). Brian Giles played with Jim Thome, Eddie Murray, and Dave Winfield on the Indians in the mid 90s. With the Padres, he suited up with Piazza, Maddux, and Hoffman. And Mike Reinbach played on the 1974 Orioles with Jim Palmer.